The Second Bon Homme Richard ( CV - 31 ) was launched 29 April 1944 by New York Navy Yard; sponsored by Mrs. J. S. McCain, wife of Vice AdmiralMcCain; and commissioned 26 November 1944, Captain A. O. Rule, Jr., in command. Bon Homme Richard departed Norfolk 19 March 1945 to join the PacificFleet and arrived at Pearl Harbor 5 April 1945. Following additional training in Hawaiian waters, the carrier joined TF 38 off Okinawa 6 June 1945. During7-10 June she joined in the attacks on Okino Daito Jima and then servedwith the 3rd Fleet during the air strikes against Japan (2 July-15 August).She remained off Japan until l8 September and proceeded to San Francisco,arriving 20 October. She left San Francisco 29 October and steamed to Pearl Harbor to undergo conversion for troop transport duty. From 8 November 1945to 16 January 1946 she made trans-Pacific voyages, returning servicemen to the United States. Bon Homme Richard then reported to Puget Sound NavalShipYard for inactivation and was placed out of commission in reserve 9January 1947. Bon Homme Richard was recommissioned 15 January 1951 and on 10 May departedSan Diego for the Far East. She Joined TF 77 off Korean on 29 May and launchedher first air strikes 31 May. Bon Homme Richard continued operations withTF 77 until 20 November 1951. The carrier reached San Diego in mid December and on 20 May 1952 was off again to the Far East. She Joined TF' 77 oncemore on 23 June and took part in the heavy strikes against the North Korean power complex (2~25 June) and the amphibious feint at Kojo (12-16 October).She continued operations against North Korean targets until 18 December1952 and then steamed to San Francisco where she arrived 8 January 1953.Her classification was changed from CV- 1 to CVA 31, 1 October 19562. 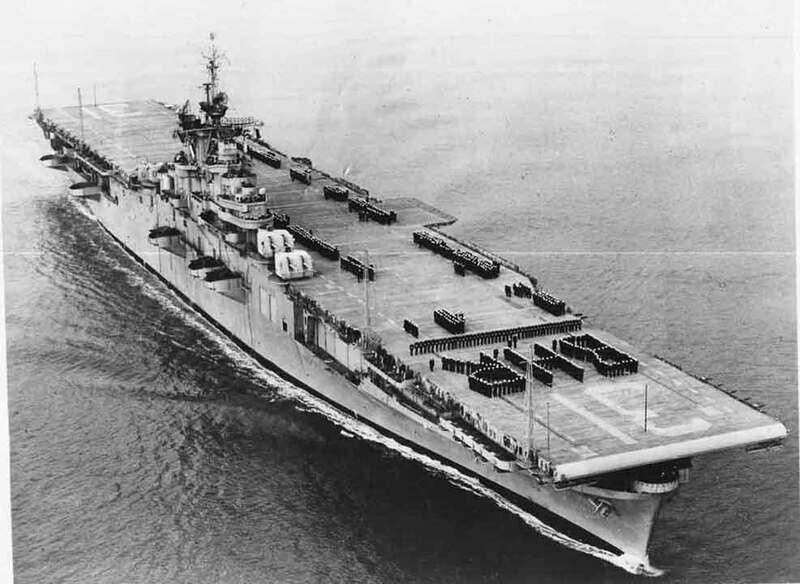 Bon Homme Richard went out of commission 15 May 1953 preparatory to modernization.When recommissioned September 1955, She had an angled and strengthened flight deck, enlarged bow, enlarged elevators, and steam catapults. Shecompleted her conversion period 31 October 1955 and commenced sea trials in the Almead-San Diego. Bon Homme Richard has since continued to servewith the Pacific Fleet and has made two tours of the Far East.